Turkish Delight. Butterbeer. Whipplescrumptious Fudgemallow Delight. All foods, yet, when you read them, didn’t your mind automatically jump to The Chronicles of Narnia, Harry Potter and Charlie and the Chocolate Factory? Literary recipes, inspired by children’s literature, YA and the classics, are first and foremost what you’ll find on InLiterature.net. As authentic to the original description in the books, you can explore the world ofyour favourite books to your heart’s —and stomach’s— content. But there are a number of reasons why you might be here. To throw the best Harry Potter party ever. I walk you through how I threw my own party, to how to style the smaller details like a potions set up. Free printables are also available, from the Chocolate Frog box to the Hogwarts Express signage. Not to mention all the delicious treats, from Honeydukes to Mrs Weasley’s home cooking to Hagrid’s attempt at Harry’s birthday cake. The copycat pumpkin juice recipe is a must for everyone, while the recipe for 1800’s butterbeer is a favourite for adults (it’s alcoholic). To find a recipe for Alice in Wonderland Eat Me cookies to make for your kids this weekend. While you’re at it, you might want to explore other nostalgic recipes from children’s literature to share with them, including raspberry cordial from Anne of Green Gables. To plan your next trip and include your favourite literary stops, from a day trip to Sleepy Hollow to a trip to New Zealand for Hobbit fans. 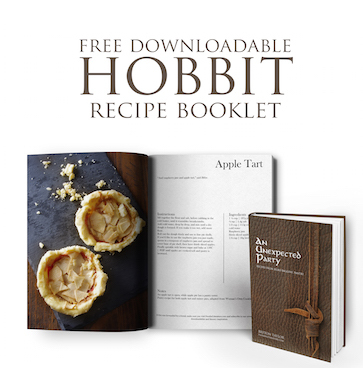 Hobbit fans can also find themselves rummaging around in Bilbo Baggin’s pantry or sampling an Elvish treat. Much like we find ourselves lost for hours in a book we love, I hope you find yourself doing the same on InLiterature.net.